Once your right hand is positioned with right leverage to control the bow (see the first five videos in Technique Video Group 1), the primary controllers on our right hand are the forefinger and the pinky. Most of the time the pinky is unnecessary, except when needed as a counterweight when playing very close to the frog. The forefinger is the most important controller of the bow, and it operates simply from the base knuckle. There is no need to bend or straighten that finger; in fact that could be counterproductive. If you bend the forefinger on the bow such that it touches the bow, the fingertip will be tempted to to grab at the bow, actually pulling the bow away from the strings while the upper part of the forefinger is aiming to do the opposite — trying to push the bow down into the strings for control and sound. For this reason, it’s important to keep our the fingertips of our right hand away from the bow, except for the pinky, which perches on top of the stick, curved daintily as if it went to finishing school and learned to hold tiny tea cups. 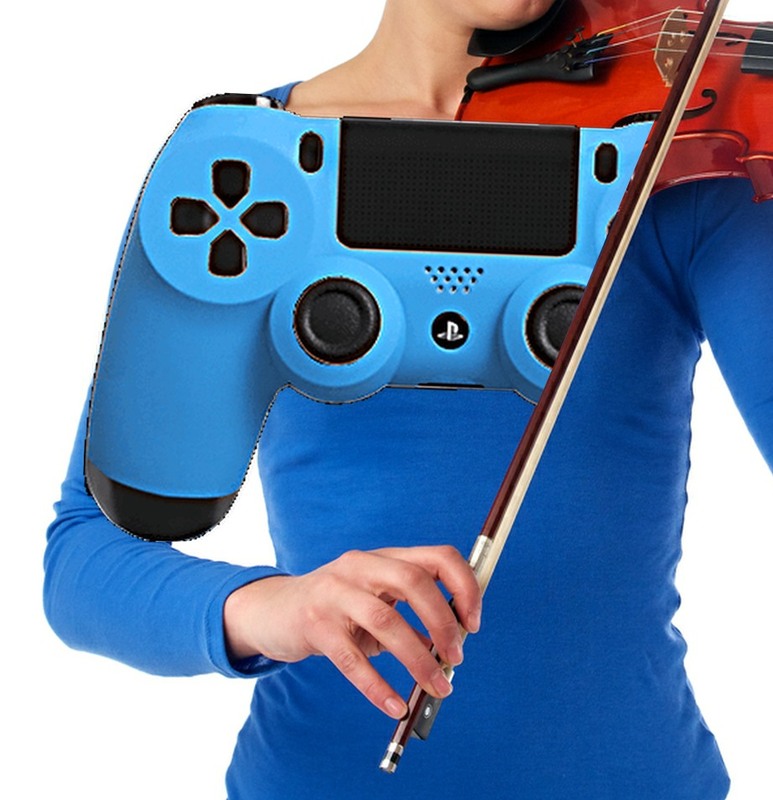 All we need for controlling sound is the forefinger, operated from the base knuckle; we don’t need all the hand and forearm and upper arm muscles for this — using those big muscles is a waste of energy, and just plain overkill for the delicate motion of moving the bow on the strings. Being efficient with your muscle controllers means getting the desired results more easily without getting tired. Sound is controlled through a ratio of speed vs pressure. As we just noted, pressure is controlled by the forefinger, and technique games like video #3 in TechVid Group 1 (the Triangle), or video #1 in TechVid Group 2 (Notches) are really good at teaching the forefinger its job. Speed, however, is controlled one joint farther up the arm: the wrist. It’s the wrist which leads the bow, pushing downbow and pulling upbow. The rest of the arm just follows the lead of the wrist. For more detail on these movements, see the article about “Push vs Pull”. The fingers of the right hand are like the bristles of a paintbrush, and the wrist is like the handle. It leads the way when we want to paint in a new direction, and the fingers follow, as flexible as the bristles of the brush, so as to “paint” the rosin on smoothly for a smooth sound. Bowing with stiff fingers is like painting with a dried-out paintbrush. You might get away with some color/tone in the middle of the stroke, but the edges will look/sound very rough. A good sound is produced when the ratio of bowspeed as controlled by the wrist is matched in each part of the bow by the pressure controlled by the forefinger. Experiment and notice the sound and feel of these controllers. The “Long Bows” (video #4 in TechVid Group 1) is a good exercise for paying attention to this. The wrist also keeps your bow straight, just as it naturally does if you draw a straight line on a big piece of paper, drawing away from you, and back toward you. It’s your wrist that takes up the slack and allows your fingers to push and pull that pencil down the paper and back up again. If it is stiff the bowing job passes along to the next joint, which is not really equipped for it! The next joint is the elbow. It’s “job” is to do virtually nothing! If the elbow takes it into its (head?) to stiffen up and try to lead the bow, it will pull back for the downbows, as you would if you were pulling on a rope or sawing a board. This is the movement that makes a fiddler look and sound like he’s “sawing” away on the fiddle. It makes for a rough and insensitive sound because there can be no smooth bow changes, and since the bow can’t move in a straight line when the elbow is tightened up, the sound toward the end of a sawing bowstroke produces more slip & scratch than musical tone. Ideally, the elbow is simply a hinge allowing the wrist to lead the bow. The shoulder, is not (contrary to popular belief) the final joint of the arm. 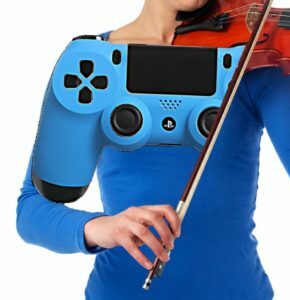 The shoulder’s flexibility is what actually allows the elbow to tilt up or down, so that you can choose which string you play on. The shoulder also adjust very slightly to help your bow play right between the bridge and fingerboard, so you get the most range of pressure for control and expression. If you’re too far toward the fingerboard, the string can’t take much pressure without scratching, and if you’re too close to the bridge the sound will be wispy and whistly unless you bear in harder with your forefinger. Place the bow on the bridge, and then over the fingerboard, and go back and forth, taking note of the physical motion in your arm that allows for this. It goes all the way back to the shoulder. Now place the bow halfway between bridge and fingerboard, and take a mental picture of how that feels as you try it in different parts of the bow. This is the feeling you want to hang onto. Yes, there is one more joint controlling the right arm, and it is located where your collarbone meets the top of your ribcage, at the base of your neck. This is the joint that allows the shoulder to hunch up or drop down. The key point about this joint is: don’t use it! There is never a reason to hunch the shoulder, so always relax this joint at the collarbone and keep your shoulder down in a relaxed position. In the next article, we’ll take a look at the joint controllers of the left arm!